Qatar 2022: World Cup stadium every 6 miles?! This might be boring to some, but just as a reminder: Qatar’s World Cup bid stood against FIFA recommendations, which suggested no city should have more than two host stadiums. And while the 12 stadia proposed were spread across 7 administrative districts, in reality 9 of them were either in Doha or in its direct suburbs. Today, exactly 5 years since the FIFA decision approving Qatar’s bid, the hosts named the two final locations for host stadiums. In short: there will be 8 instead of 12 and all of them will be built within close proximity from one-another. In fact, two most distanced stadia of the 2022 tournament will only lie 55km (34 miles) from each other, still in Doha’s suburban area. This means the 2022 World Cup will be by far the most congested tournament ever, because the number of tickets sold should remain beyond 3 million. On the one hand this represent unprecedented challenges in terms of logistics. On the other, imagining a World Cup where stadiums are within walking distances from one-another is simply fascinating. We’re unable to judge whether Qatar will be able to make it happen flawlessly, but already the country’s road and public transport networks are stunning. Below we present the stadium locations and on the second map distances between each stadium. Please note though that three of these sites are approximate. In the case of Lusail (largest stadium) the initial site was changed and we lacked coordinates, while two Doha districts of Ras Abu Abboud and Al Tumama were just named this week and detailed sites weren’t disclosed yet. 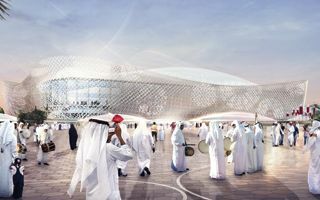 Regardless of the criticism reserved for FIFA and Qatar regarding harsh climate or extreme proximity of the venues, one thing we can be sure of now is that the 2022 World Cup will be the first since 2006 to have stadiums ready in time. Enabling or foundation works are already ongoing on 6 of the 8 sites and first venue will be ready years before the competition. A separate portion of criticism fell on Qatar for dramatic working conditions for foreigners. That said (or likely: because of that criticism), Qatar implemented programmes to improve workers’ rights and living/working standards. So far there is no information of any tragic accidents on any of the stadium sites.